Makes it impossible for Mosquitoes to breed on water. Item# 94025 Size 128 fl. oz. Item# 94042 Size: 16 fl. oz. Item# 94044 Size: 33.9 fl. oz. Don’t give mosquitoes a nearby place to breed. Most mosquitoes can fly no more than one to three miles, and some mosquitoes such as Asian tiger have a flight range of just 100 yards or so. Eliminate standing water where mosquitoes breed by emptying the saucers of flower pots, hauling off old tires, cleaning rain gutters and frequently changing the water in birdbaths. Walk your property with an eye for puddles. Spray our Tension Eliminator to fix your problem. Our product eliminates the tension on top of the water so that mosquitoes can not land on the surface, but instead they sink and drown. Females land on water to lay eggs but both Females and Males need water or they dehydrate and die. Female Mosquitoes also need water to deposit eggs on. Water tension allows for them to land on the water and lay eggs. 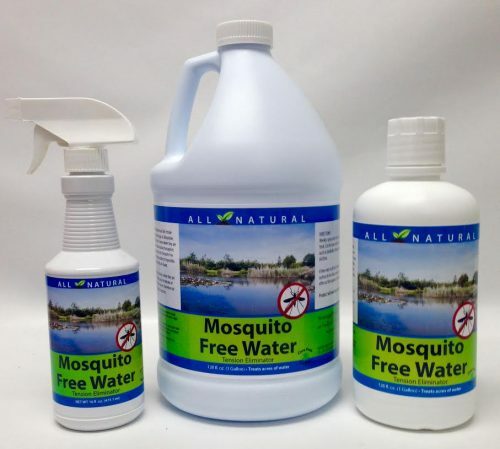 Our product makes it impossible for mosquitoes to survive in your habitat, therefore not allowing them to develop into adults. Flies- Flies cannot land on water treated with Mosquito Free Water.